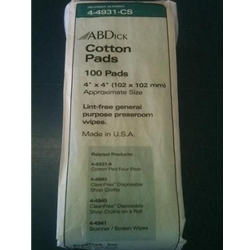 These familiar 4"x 4" Webril substitute cotton handy pads have been an industry standard for years, and for good reason. They have all the properties WEBRIL material is known for in a size convenient for many small press and plate making operations. Also great in the camera room and stripping areas.